This case study is a breakdown of the metrics and services achieved for BrackenData, the parent company of Bracken Marketing. BrackenData developed a suite of clinical trial analytics in 2015 and was ready to go to market in 2016. In April of 2016 we launched the BrackenData website and started giving the first product demos. The focus on generating sales pipeline through online inbound marketing sources was a hit, and lead to 80 inbound demo requests on the website in 5 months. Sidestory: We didn’t know it at the time, but this was the beginning of both a marketing agency in addition to an analytics business. Our contacts in the industry took note of BrackenData’s fast sales cycle and time to market penetration by way of a social media and search engine focused blogging program. 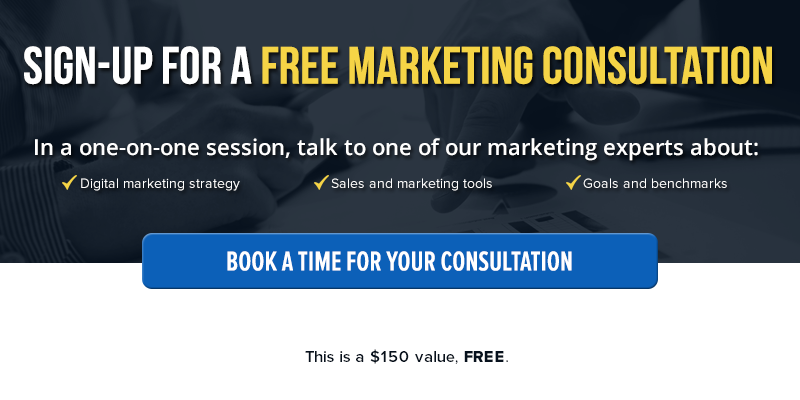 These contacts asked us to develop similar marketing programs for their businesses, and Bracken Marketing was born. Screenshot of BrackenData.com. Our screenshot tool splices the banner images because of a parallax scrolling feature we implemented, which you can see live at BrackenData.com. At the core of BrackenData’s sales and marketing success was its blogging program. Every week the company would produce a blog that used its analytics product to reveal some industry insight or analysis. These posts would shed light on a topic that industry professionals were interested in reading about, but in a way that showcased BrackenData’s analytics capabilities. Along with strategically placed demo-request forms and calls-to-action in the blog posts, readers quickly converted into sales opportunities. The blog content provided a medium for readers to familiarize with the BrackenData brand, but it was a focus on two specific traffic channels that lead to results: social media and organic search. The social media strategy consisted of heavy promotion of blog posts on Twitter (about 120 tweets per month), Linkedin, and Linkedin Groups. The organic search strategy consisted of publishing blog topics that used keywords with high search volumes and low competitive difficulty. The content of the blog posts presented a solution to the problem that was likely the cause of the search. For example, one of the highest performing blog posts from BrackenData was How to Use ClinicalTrials.gov for Business Development. The post shows up as a result for many searches around business development for clinical trials. The post also did a good job of attracting sales leaders from Linkedin and onto BrackenData’s website. The post provides tactical advice on how to efficiently use ClinicalTrials.gov to create lists of business development targets. The post also discusses the advantages of using a tool such as BrackenData’s TrialFinder to expedite the process and encourages readers to signup for a personal demonstration of TrialFinder. Once the demo requests were generated, a whole process went into the lead management, sales presentations, and sales reporting that aligned the team towards revenue generation. We would be happy to discuss the details of this sales program with you during a free consultation. We conducted market research on the different types of buyers BrackenData aimed to attract. For example Sales was one persona, while Clinical Operations was another persona. Once personas were decided, rules were setup in the marketing database and Sales CRM to automatically segment contacts into a persona bucket based on job title. Each email marketing campaign was designed for 1 specific persona to increase it’s ability to address recipients, which lead to higher open rates and click rates. Every 6 months we conduct a full SEO Audit of BrackenData.com to identify possible improvements to the site structure, and the next best keywords to go after. This SEO audit entails using a tool to crawl every page of the website, and analyzing page titles, metadescriptions, and more. We identify any causes for Bing or Google algorithms to penalize the domain, and quickly clean these up. The SEO audit is paired with research on 150-200 keywords to analyze which strike the perfect balance of relating back to the business, having high search volumes, and low competitive difficulty. These are then the keywords we go after when planning blog content. Smart Calls-to-Action were implemented. Examples of smart CTAs include those showing up on key pages after a user has scrolled more than 50%, and those which display different content depending on a user’s previous interaction on the site.